United CEO Apologizes For Passenger Being Dragged From Plane : The Two-Way After a man was dragged down the aisle of a United Express flight, the airline initially blamed the man for refusing to leave the flight. Now the CEO has issued a fuller apology for the incident. 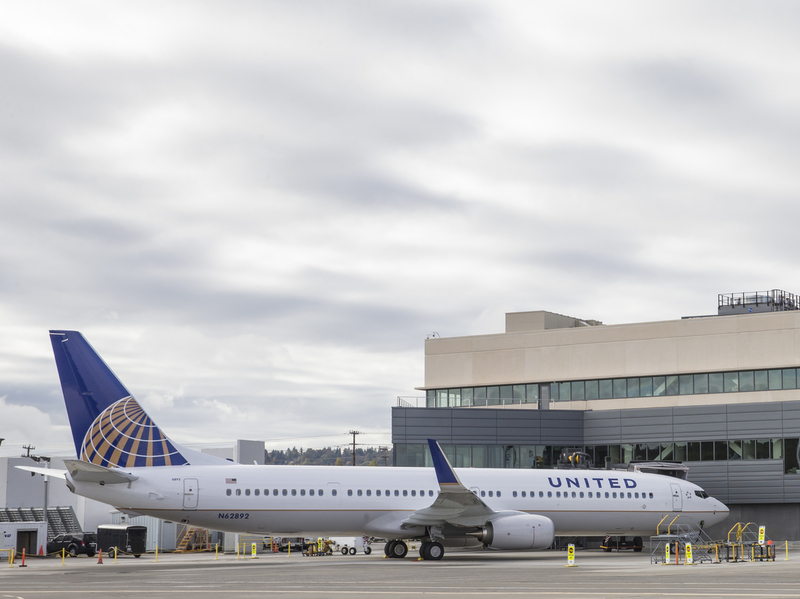 A United Airlines Boeing 737 is parked outside the Boeing 737 Delivery Center in Seattle in 2015. A passenger was forcibly removed from a flight from Chicago to Louisville, Ky., on Sunday. The reaction from the public started with gasps of horror and built to cries for a boycott. Now, a day and a half later, United Airlines is admitting it did something wrong. On Sunday night, a passenger on a United Express flight from Chicago to Louisville, Ky., was told he had to give up his ticket so a United crew member could take his seat. The man refused: He's a doctor and said he had patients he had to see. United called security officers, who violently wrenched the man from his seat, bloodying his face, and dragged his limp body down the aisle. The passenger, David Dao, is at a hospital in Chicago recovering from his injuries, member station WFPL reports. The scene was recorded by other passengers and posted online. You can hear witnesses shouting at the security officers, saying what they were doing was wrong. The outcry online was instantaneous, too, with prompt calls for a boycott. United's first response was to defend its employees' actions. A representative on Twitter said Sunday night that the flight was overbooked, no one had volunteered to leave, and the customer in question "refused to leave his seat" when instructed. CEO Oscar Munoz issued a statement midday Monday that included an apology — kind of. "This is an upsetting event to all of us here at United," he said. "I apologize for having to re-accommodate these customers." The idea that the scene was upsetting to United — with no mention of the trauma for Dao or witnesses — raised eyebrows. And the euphemistic phrase "re-accommodate" inspired a fresh round of outrage and no small amount of mockery. From there, incredibly enough, it went even further downhill. On Monday night Munoz sent an email to United Airlines staff that was obtained by the media, including The Associated Press. In the email, Munoz confirmed that the man had not posed a problem until he was asked to leave the plane to make room for crew. After the man refused, Munoz said it was "necessary" for crew to contact security, and it was unclear "why this customer defied Chicago Aviation Security Officers the way he did." Security officers "were unable to gain his cooperation and physically removed him from the flight as he continued to resist," Munoz wrote — a bloodless description of the bloody encounter. Munoz said the passenger was "disruptive and belligerent" and employees "followed established procedures." The United CEO told employees he "emphatically" stood behind them. His emphasis on the doctor's "defiance," and lack of acknowledgement of the violence shown on the video, dug a deeper hole for United Airlines. As the hours passed, the online fury showed no sign of quelling. The story went viral in China — the doctor is Asian, and observers questioned whether a white passenger would have been treated so roughly. United stock shares fell dramatically. Now United is giving it another shot — with an apologetic statement that says, rather hopefully, "it's never too late to do the right thing." Munoz promises a "thorough review" of United policies. Axios has more detail on a few of those policies — including the fact that the flight wasn't originally overbooked but became "oversold" as soon as United discovered it had crew to transport. The incident hasn't just inspired shock and horror over the violence depicted. It has also brought attention to the limited rights of passengers on flights. Airlines have broad discretion to eject people from flights for nearly any reason, a consumer advocate tells NPR. And it's perfectly legal for an airline to sell more tickets than seats and then block ticket holders from traveling. Many people give up their seat willingly in exchange for money, but last year some 40,000 people were bumped involuntarily. The U.S. Department of Transportation has launched an investigation into whether United followed regulations in this incident. The debacle has also sparked a controversy in Kentucky, where a local newspaper reported on Dao's past, leading to accusations of victim-blaming. You can read more about that story at member station WFPL.